Improper design of full bleed is the number 1 cause of delays when customers order prints. It is essential for the customer to know what full bleed is, and more importantly, how to properly design for it, when ordering prints. This document was written to quickly and simply outline and explain to customers in detail what full bleed is and the necessities of designing for full bleed. 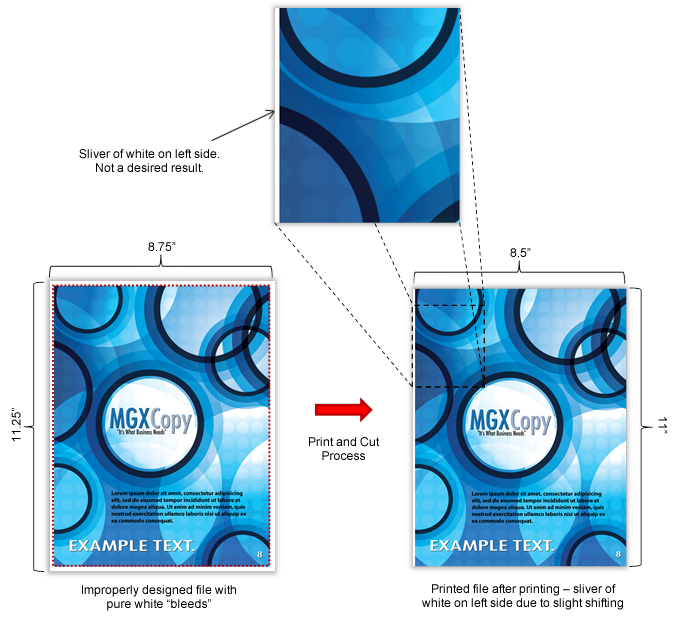 If there are any questions, please do not hesitate to call MGXCopy at 1-877-649-5463. The helpful representatives will be more than happy to assist in any full bleed problems. Add bleeds - extend the design dimensions 1/8" on all sides. Adding a white border as the "bleeds" of the design. Putting critical text in the safety margin and/or full bleed area. Expanding the file to increase the dimensions. 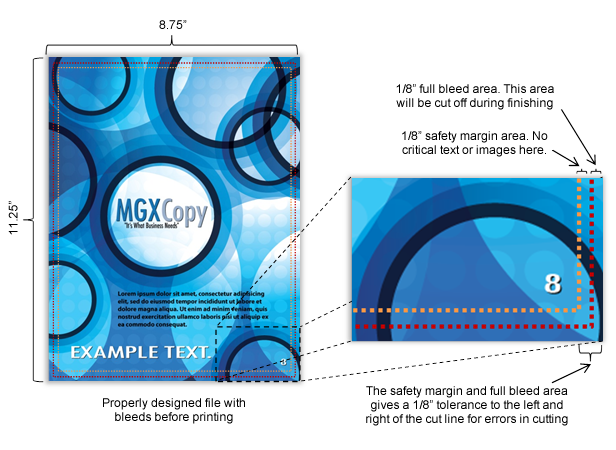 It is incredibly important for MGXCopy's file check department to receive properly designed files to guarantee a quality and timely production for an order. Turnaround times for orders placed on the site assume that submitted files are designed correctly. Incorrectly designed files, including files not designed properly for full bleed, will delay an order. Full bleed printing is printing to the edge of the paper so the final result has no margins. If a file is not prepared for full bleed or is not requested to be printed full bleed, there will be a 1/8" white border margin on all sides. An example of a printout with no bleeds and full bleed can be shown in the example flyer below. However, files that are to be printed for full bleed (no margins) need to be specifically designed for full bleed. When designing for full bleed, the design must have "bleeds" and "safety margins" (safety margins will be explained later). The bleed is the extension of the print by 1/8" (0.125") on all sides of a document that won't be in the final printed product. 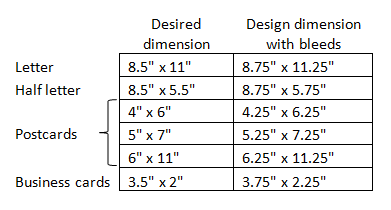 Therefore, if an 8.5" x 11" document with no margins was desired, the designed file must be 8.75" x 11.25". An example of the above flyer with no margins that was originally designed as 8.75" x 11.25" with 1/8" bleeds on all sides is shown below. The area outside of the dotted red lines is the bleed of the image. All printers have a very slight print shift when printing a file. Therefore, the document that's being printed needs to be printed on a larger sheet of paper so the printer can print the full dimension of the document without having to worry about very minor shifting errors. Since the printer prints on a larger sheet of paper, the paper needs to be cut to the proper dimension of the file. Without a larger sheet of paper, the resulting print edges might have white slivers after cutting. Therefore there needs to be 1/8" bleeds in order to account for standard print shifts so no white slivers show after the cutting process. The dotted red lines in the full bleed 8.75" x 11.25"example picture above are the cut mark lines. Safety margins are 1/8" margins inside the cut line of a design. The safety margin area is between the orange and red dotted lines. The safety margin area is the area in the main print area that runs the risk of being cut due to the error tolerance of the print shift. No critical text or images that must be on the printed document can be in the safety margin area because they run the risk of being cut. One of the biggest mistakes when designing full bleed is adding a 1/8" white border around the design to give the file "bleeds." This is not a proper way to design for bleeds because the bleeds actually have to be part of the design. Minor printing or paper cutter errors may shift the paper very slightly when cutting, which means that a section of the full bleed area will be part of the final print. If the full bleed area is white, then the final print might have a white sliver on the edges after printing. Another big mistake when designing full bleed is putting critical text and/or images in the safety margin area. Anything within the safety margins runs the risk of being cut off during the trimming process. Therefore, if any essential text or images are in the safety margins, they might get cut off, and the desired result will look bad. It is common for people to put page numbers in the safety margins, which puts the numbers at risk of getting cut off slightly. 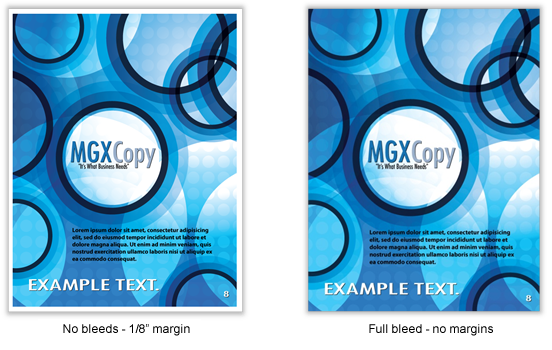 In this version of the MGXCopy flyer, text has been placed within the safety margins in 3 locations. After the printing and cutting, the text was cut off in all 3 locations. Expanding the file to increase dimensions. Often times customers will submit a design without full bleed (for instance, 8.5" x 11") which needs to be redesigned for full bleed as an 8.75" x 11.25" design. 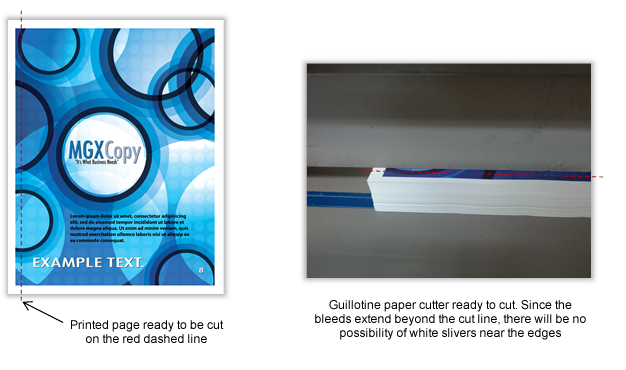 The quick fix that customers most often do is expand the document so it fits to 8.75 x 11.25." While this may work in some instances, more often than not, the design ends up having critical text and images within the bleeds and/or the safety margins. If a document is expanded to meet full bleed requirements, make sure there is no critical text and/or images within the bleeds or the safety margins. Cut marks are not recommended when designing for full bleed. Cut marks are technically part of the full bleed design, and any cut marks within the bleeds may show up in a final print after the cutting process. Why should I order from MGX Copy? How can you have such great prices? My order is really detailed and complex. Can I speak to a service representative to set up and place the order? Can I get a tracking number on my order? Can I get a proof before placing an order? How fast can I get my order? What are my turnaround options? What payment methods does MGX Copy accept? How do I avoid delays caused by file and design issues? How do I transfer my CD/DVD data? What is my order's production schedule after ordering? How does shipping turnaround affect my order's schedule? What dimensions should my file be in? Full Bleed - What is it? And how do I design for it? What are templates for and how do I use them in my design? 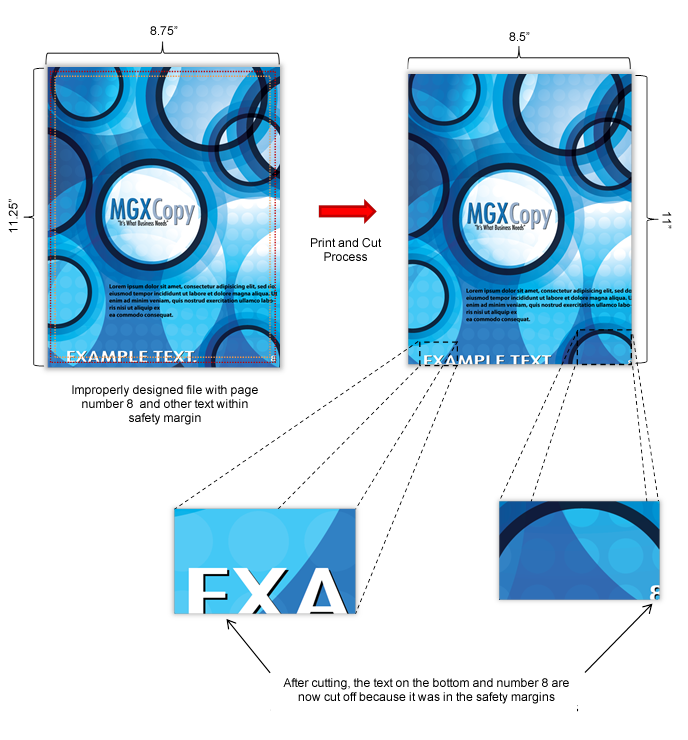 What file formats does MGX Copy accept? Why do my prints come out on a slightly shade of color than what I see on my monitor? Is there anything special I should do if I have special fonts? What resolution should I use when I design my file? What color profile should I set my file in? RGB or CMYK? And what's the difference? What margins should I create in my file for full bleed and/or cutting? I am not sure that my files are print-ready. 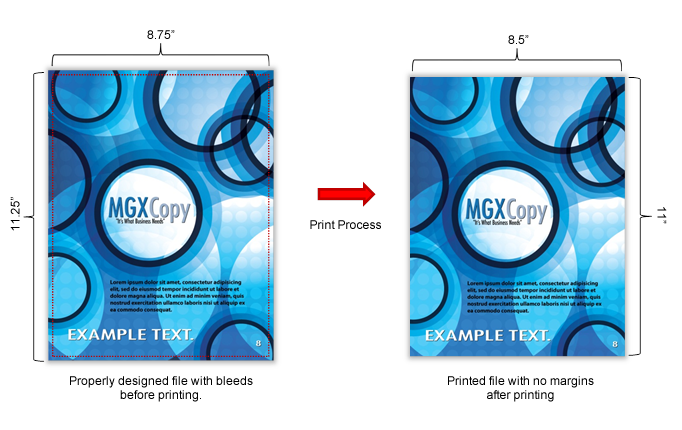 Can MGX Copy help? I am not satisfied with my prints. What are my options? What resources does MGX Copy make available to me? I am having trouble using the website. What should I do next? Security Policy &mdash; How does MGX Copy secure my data from hackers and malicious software? Return Policy &mdash; What do I do if my prints do not meet my expectations? Where do I find the MGX Copy Uploader and how do I use it? How do I send you my DVD/CD data and print designs? I am having problems using the MGX Copy Uploader. What do I do now?